So, I have to be honest with everyone: Today’s strip was a last-minute add-in. I improved it after reading commentary on yesterday’s strip, more specifically comments on the Semi-Secret Director Commentary. I mentioned that it had occurred to me to draw the final panel of the previous strip as a Star Wars reference since Selkie refers to her marker as a “laser sword”, but such a reference wouldn’t work for Amanda since she’s not a Star Wars-y type person so I abandoned the idea entirely. Some readers suggested going for it but with a differing reference for Amanda. I really liked that idea so I thought about it, and came up with this: Selkie has an established love of mad science, and Amanda has recently shown a fascination with fairy tales. Instead of media references, what if I came up with fantasy-states along those lines? Something a bit more personal to each character. 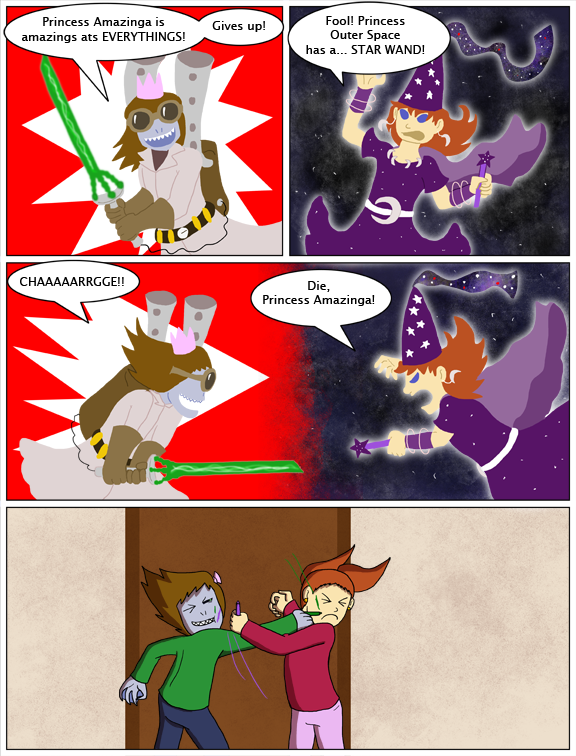 And thus, we came to this epic showdown: Princess Amazinga, Gadgeteer Extraordinaire vs Princess Outer Space, Ruler of the Stars! And lastly, a Fanart Update! 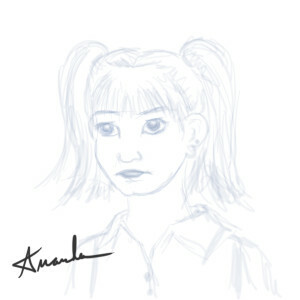 Jacque of ISO Photo Studio sent me this drawing of Amanda! Thank you very much, Jacque! 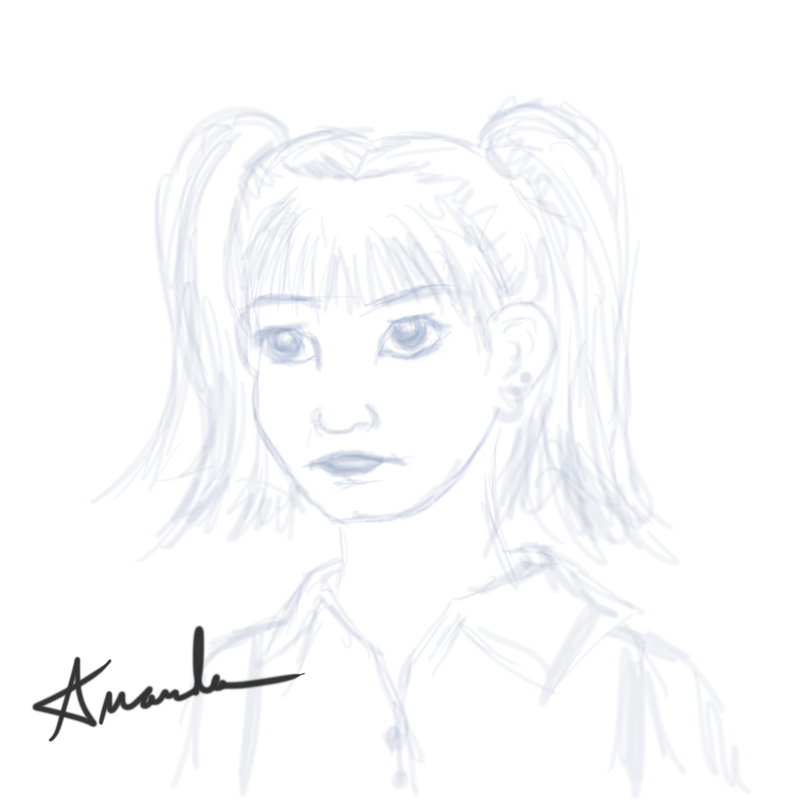 Had I gone ahead with media references anyway, Amanda probably would have been Disney's Cinderella. Maybe because it’s a WIP but from the looks on their faces, I get the impression that Selkie is actually playing and Amanda is not. I don’t know, if it does end bad its because of how competitive Amanda is and her need to be the best. I do think she is playing right now though, mainly cause she called her Princess Amazinga instead of her usual insults. I might be reading to much into it, but there is a world of difference between “Charge!” And “Die!” Also, Selkie is smiling(mostly), but Amanda has a dedicated frown. I think this is going to escalate quickly. Like, flour-mill explosion quickly. Yeah, Selkie has the kind of grin that’s welcoming an (ultimately) friendly spar. Amanda is glaring like she’s out for blood. But don’t forget. Selkie has learned to use her grin to intimidate. When she goes on the attack for real there is a smile these days as well. Humans are the only species that show their teeth as a friendly gesture. It is usually an aggressive act elsewhere in the animal kingdom. Selkie’s predatory instincts could be showing here. Interestingly enough, smiling is not a learned behavior in humans. Even blind babies will smile as an involuntary indication of pleasure. There are some cultures however that dislike smiling. Many Russians feel that someone that smiles all the time is insincere and phony all the time. Humans also as a coping mechanism for things that make us feel uncomfortable or jittery, smile. So among us humans, smiles do mean a lot and are a very complex concept. You can certainly be trained to suppress smiling — as with all natural behaviors. Without any data, I would actually guess that smiling when uncomfortable is either (1) like purring, a way to try to stimulate a better feeling in yourself, possibly by triggering certain chemicals, or (2) like trying not to cry in public, a way to reduce social embarrassment by displaying reduced emotions or dissimilar emotions from what you really feel. Though of course it’s nigh impossible to fake a smile you don’t feel and have it come across as genuine (Duchenne), which is partly why it’s difficult to smile for a photograph that takes too long. I am one of these people that don’t really smile. Unless I’m dealing with my niece or I’ve got an evil plan, the most you can expect of me is a look of mild interest. I laugh, make jokes, just not a smile. But I’m the odd one. I was under the impression that since Amanda got markered very close to the eye it’s why she’s frowning, like as a natural reaction rather than her being angry. Although she did say die, they’re clearly pretending to be crazy superhero/power ranger/sailor scout/mad scientist/princess/jedi things and it could just be her getting in the spirit of acting. I mean, she didn’t seem super angry, she seemed excited at the prospect of this. Her temper will probably get the best of her if Selkie wins or gets it on her clothes or something. And if she wins she’ll probably gloat, but so would Selkie so… who knows. Selkie would probably sulk and make snide comments of she lost as well, but she probably wouldn’t flat out get angry like Amanda would. I don’t think Amanda would truly wish death upon Selkie just because she dislikes her. I’m sure Amanda is intelligent enough to understand the concept of truly wishing death upon someone. Also the fact that it’s a marker that she’s pretending is a magic wand against a laser sword. As far as no one yelling at her, I mean, Andi did shout for her to stop. She didn’t directly yell at her, but she told her to knock it off and Mari said they’d better stop by the time she counts to 3, but Theo egged the girls on. Sure, Amanda is definitely using this as an opportunity to marker someone she dislikes under the pretense of just having fun, but I’d like to think, given her initial reaction and the fact that they’re playing pretend that she’s at leat having a little fun, and not just because of the fact she gets to kinda be mean to Selkie. I don’t think she truly hates Selkie as much as she’s made herself believe. We’ve seen small instances of her being civil to Selkie, well, civil for Amanda anyways. I think she just reminds herself she’s not supposed to like Selkie for appearances sake. Selkie showed up after Amanda got returned and everyone was making a fuss over her instead of the child who was dumped and abused. So of course Amanda had some resentment there, but I think a lot of her ungodly hate for Selkie is fabricated. What would the other kids, many of which have been shown having a penchant for tormenting, think if Amanda hadn’t drawn attention to Selkie being an easy target? I think somewhere in her mind she realized that SHE was a prime target to be bullied for being returned. Clearly that meant something was wrong with her. So not only did that put her self esteem in the toilet, it fueled a lot of insecurities and fears that she turned on Selkie. So I truly believe she only dislikes Selkie for convince rather than true malicious intent. Selkie was there at the wrong time and a very easy outlet to pour her feelings onto, not only that, but tons of circumstances have made it so she believes now more than ever that she ‘should’ hate Selkie because it’s ‘justified’ and it just seems right to her. I agree. Maybe she also puts on the act around people she knows (and is comfortable with) for attention? Back at the aquarium Selkie and the girl in question were having an actual conversation (with the occasional casual insult.) You don’t casually speak with your most hated enemy like that. Yes, I very much think she tends to be more critical and harsh towards Selkie when she’s around the other kids. When it was just her and Selkie in the principal’s office and the secretary she also wasn’t as horrid as she is when other kids are present, the aquarium also, as you pointed out. When it’s not around other kids, she seems to regard Selkie as more of a person, albeit one that she doesn’t like. I think she just doesn’t like Selkie very much, but doesn’t intensely loathe her like she makes it out to be. Try again, I re-uploaded it. Good thing you didn’t give them Sharpie pens. They’re supposed to be indelible. Sharpies come off skin just like everything else. Largely because humans slough off skin over time. Actually, though, Sharpies come off normal things like paper as well. “Permanent marker” doesn’t actually mean that the marks never fade away. I was reading this a few months ago and going “Whaaaaaa?” but it seems that we don’t yet have a writing medium that actually makes a truly permanent mark. I don’t know that this isn’t true of other mediums as well. Mom used to say ink was easier to get out of clothing than pencil was. Writing mediums are pretty fascinating, actually. … Yeah it’s time to introduce Selkie to the wonders of Girl Genius, she would LOVE it. Selkie would love it! She’s a Schmott Gorl! Vhat hy vunt to know is, vould she schmell “niiiiize” to da Jaegers? I used to follow GG regularly but I faded off during the train run by monks. Need to pick it back up sometime. So she can read a boring shaggy dog story that is terrible at wrapping up story lines and got so convoluted/boring I gave up? Having just gotten annoyed by my research into the problems of quoting copyrighted song lyrics… I can agree that kids don’t need canon and leaving it out is probably a better choice overall, but… reinterpretations of existing stories are the bread and butter of culture. We currently have a system set up to disincentivize this, to the detriment of our shared cultural heritage. I’m glad I grew up in the culture of fanfics and fanvids, and that I felt free to express myself in both these media. I’m glad my brain started making unwritten fanfiction long before I got on the internet and realized it was an existing thing with a huge surrounding culture and tons of subcultures. And I was saddened to learn that our legal system makes such expressions “under the radar,” accepted only so long as everyone pretends the right hand doesn’t know what the left hand is doing. I’m sad that writers feel the need to avoid reading the wonderful stories their stories have spawned. And I hope to live in a future where kids who retell their favorite movies using Littlest Pet Shop characters can share this, including any incidental copyrighted songs they sing, to a worldwide audience without any sudden realization that their efforts can be squashed by an over-eager legal system. …rant released. I think I’ll go read more webcomics now. The strip, I thought, was kinda cute. The fan art, though, is AMAZING! The eyes, especially. He did an amazing job of capturing the vulnerability and uncertainty. She, ☺ and thank you very much. I’ll be honest, Amanda’s breaking my heart this arc. I have to concur Jacque. That artwork is amazing. Dunno if intentional but found it curious how Selkie seems to be having fun and enjoying herself while Amanda is all serious and angry looking. I smell a fanart coming.. This is actually quite adorable. I kinda hope they just get it out of their system and end up collapsing in laughter together. It’s all fun until someone loses an eye.